The only individual piece of clothing more important than a good pair of versatile shorts are any one of my pairs of Exofficio underwear. But while the undergarments are done and purchased and last a long time, the perfect shorts are a little more difficult to find. 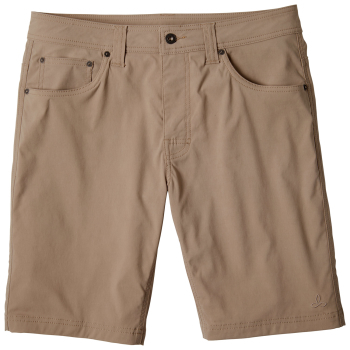 I had a great pair of Arc’teryx shorts a couple years ago, but they were discontinued. Recently, I found another lovely pair with the Prana Brion Shorts. The Brion Shorts are the perfect length to be just barely passable in social circles (working in cafes, wandering around the city, etc.) while being short enough to be up for any challenge (climbing, running, etc.). Flexible and sturdy, these shorts are made of the perfect material to be up for the challenge, yet comfortable. The one knock I’d say they have is that they hold dirt a little too much. I’ve no problem with them getting dirty, but when you wash them and they maintain small stains, that’s a bit of a bummer and has occurred a little over time. But...it’s notable that I’m feverishly difficult on clothes. I end up staining pretty much everything, including dress clothing. And I have used these to garden in...which is the messiest. But all-in-all, I absolutely love climbing with these shorts...or working in the yard with them...or anything, really. Give them a go if you’re looking for a versatile pair of shorts that you may greatly enjoy, won’t break the bank, and should last a long time.